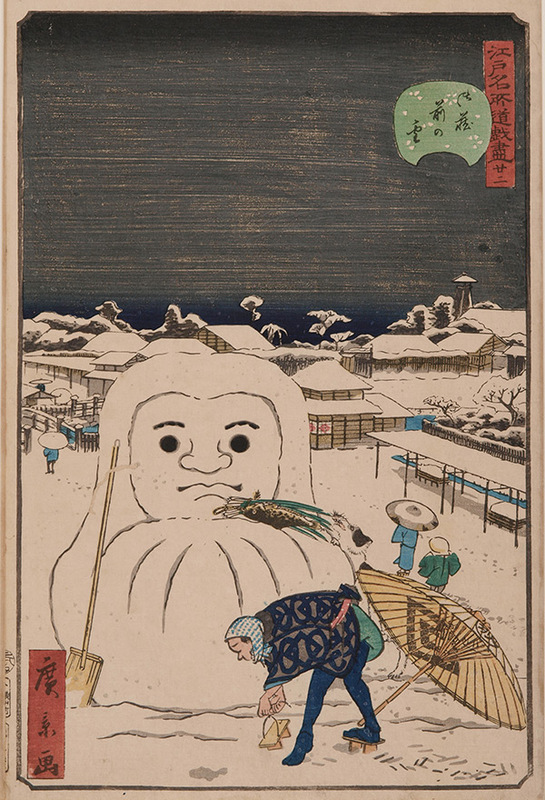 Utagawa Hirokage (active 1855 - 1865) Humorous Events at Famous Places in Edo: Snowman, 1859. Oban. Hirokage was a pupil of the great Hiroshige and is known today for this humorous series which parodies his teacher’s famous series 36 views of Edo and for a triptych depicting a fight between the fish of the sea and the fruit of the land. This is a fine winter scene and depicts a traveller stopping by a snowman to tie his shoe. A passing dog is seen in the act of stealing a parcel of fish that the man has laid on the shoulder of the snowman. The style of Hiroshige is well parodied, nevertheless the print has its own strong character and sense of design. This is one of the very few depictions of snowmen in Japanese. The print is full size in fine condition with strong colour and impression and no condition issues to report.